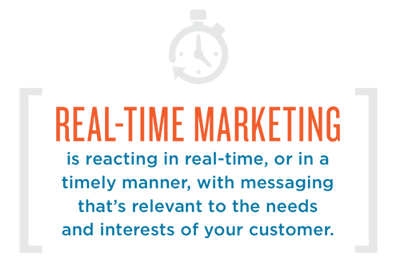 Real-time marketing is marketing that happens as real-time events occur, with the basis being the real-time event and the goal being to gain awareness, build your email list, or drive sales of a specific product or service. While it’s not technically planned, you have to invest in the technology and potential services needed to perform real-time marketing that gets results. Use Facebook, Twitter, forums and even comments on blog posts, as well as other social media to gather the information that you need to conduct real-time marketing information regarding your industry on your target audience. All of these can be very helpful to your business and increase your bottom line exponentially. Engage Your Audience – Using real-time marketing efforts and listening to social media for conversations your audience is having will help you engage better with your audience in real time. Improve Understanding of Your Customers – By monitoring the chatter among your customers within a forum or group, you can get a deeper understanding of what your customers need. Deliver More Relevant Content – The understanding you develop can help you improve the type of content you create overall, not just in real time but planned content too. Connect Better with Customers – This understanding helps you connect better with customers in a way that makes them feel important and understood. Create Innovative New Products – Your new understanding of your customers and the audience will enable you to create better products and services truly designed just for your target market. Get More Leads – Deploying real-time marketing efforts will help you get more leads because you will find ways to get your products or services to relate to what is happening right now. Improve Conversions – When your audience feels as if you really know them and share their values, they will be more likely to make a purchase from you. Grow Your Business – All of these activities will ultimately help you grow your business faster than you may have thought possible. Any one of your real-time marketing campaigns can become viral. Using what you know about your audience, the current news in the industry and the daily happenings around the world, and how it can relate to your audience will help your business grow faster. The result is that not only will you make more sales, but you will also create more products or services that are extraordinarily relevant to your audience. This happens because with real-time marketing you always have your ear to the ground and are monitoring the mood of the audience as well as the news of the times and how it can relate to your products and services. You not only send out information that connects your products and services with what is happening today, but you can actually create new products and services based on the information that you gather. It’s a win-win for your business and your customers.